Despite the growing popularity of digital radios, some of us still find it very relaxing to listen to our favorite radio programs and music from our pocket radios. Listening to the songs I love; the news and the empowering talk shows reduces my stress levels a great deal. Pocket radios provide you with the freedom of listening to your radio anywhere you want. Be it while working out, taking a stroll on the beach or during your early morning jogs, your radio will be with you. For outdoor enthusiasts, pocket radios are very ideal when camping or taking part in various outdoor activities. A pocket radio can really come in handy in knowing whether you will experience foul weather when camping by getting the weather updates via the radio. Pocket radios will also help you keep in touch with what is happening around the country as you explore the wilderness. However, finding the perfect pocket radio for your needs can be quite a headache. Every radio out there claims to be the best portable radio. To help you out, we have prepared this guide on best pocket am fm radio to assist you to grab a top-notch gadget. For a pocket radio, the weight is very important. It is what determines how easy and convenient the radio will be to have around. With this in mind, you should make sure that you go for a lighter radio. A heavy one beats the actual purpose of it being portable. Besides being lightweight, there should also be a strap or a handle for carrying it around. In this way, you can bring it along when going somewhere and you still want to catch the news. Let’s face it; a radio with only one way of powering isn’t actually the best for you. What if you miss that one source of power? Most of these radios are powered by a battery or an AC/DC power sources. Nowadays most camping gadgets are solar powered because your batteries might run low in the wilderness and you will probably be away from the grid. Pocket radios come in different options for presetting your favorite radio stations so that you can easily select any without going through the strenuous efforts of tuning. The best pocket radios will have about 10-15 presets. However, this feature is only available for digital radios and not for analog radios. If you do not mind a radio having presets, then it is well and good. With radios, not all of us will use the earphones most of the time. The speaker fitted on the radio, therefore, plays a great role in the quality of sound produced. Although the size of the speaker does not guarantee quality, there is a common belief that the larger, the better. Before you buy a radio, check to ensure that it produces the best sounds of the available options. The tone of the sound should also be well balanced. Panasonic speakers, Sangean and Sony speakers are some of the best around that you can look for. How long the battery lasts actually depends on your usage of the radio. The features the radio has also determine how much power the radio uses. The larger the speaker, the more battery it drains. An LCD screen and backlight will also use more power in comparison with those that do not. In whichever case, the longer the radio lasts with the battery, the better. If you can use the earphones, the better since lesser power is used then. I don’t think anyone likes only one station. In fact, most of us do not even have a favorite station. We just tune to where we get good music and talk shows going on and listen to that. The wider the frequency range that radio has, the better for you. AM, FM and NOAA bands should be a priority. Certain pocket radios serve more than one purpose. With these, you can use them as a clock and an alarm beside being a radio. Choices are a great thing to have. Out of these options, there is always a great product for your needs. Of course, choices come with consequences too. You do not know which one is actually the best. With this in mind, we spent hours of research evaluating the various pocket radios available in the market. Finally, we came up with the best of the very best in this review. We hope these radios will make it easier for you to make a choice. 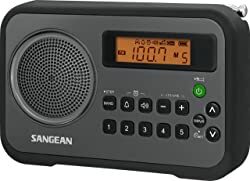 The Sangean Portable Digital Radio is the best pocket radio currently on the market. It boasts of an easy to read LCD display combined with a backlight, ability to preset up to 10 stations (5 FM and 5 AM) and an alarm timer (you can set 2). Additionally, you will also find a sleep timer that you can adjust. Do not also forget that the price is great too for such a high-quality pocket radio. These features make it quite hard to beat among pocket radios. It easily tops our pick for the best portable am fm radio. For a pocket radio, the weight is a key consideration. A heavy pocket radio is not worth the title “pocket radio” as it weighs you down. The Sangean weighs in a paltry 12.5 ounces. There is no way you would be uncomfortable with that in your pockets. This radio forms a great companion for your outdoor activities such as picnics, camping, and ball games. In such activities, the build is sturdy enough to take the various hits and bumps that it encounters as you have fun. With this radio, you have two powering methods. You can decide to use the AC adapter or use 4 AA batteries. When it is on batteries, an indicator shows you how much power is still left in them. This Sangean pocket radio features a wide range of amazing features. An “auto seeks” function seeks any active station in your locality for an easier channel changing. A digital tuning option eliminates the inconvenient dial tuning. Versatility in this radio is enhanced by the inclusion of a dual alarm setting with a humane wake-up system (HWS). The HWS gradually raises the alarm sound so as not to wake you abruptly. All these controls are strategically placed for ease of use and access. Better still, these displays are relayed on the LCD display that is very easy to read. A backlight is provided for night times reading of the alarms and frequencies. When you do not want to disturb those around you, simply plug in your headphones in the provided headphone jack and listen to your pocket radio. 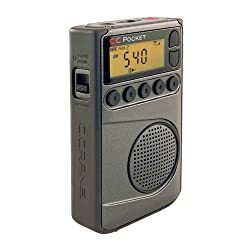 The CC Pocket Radio provides a great alternative to our top pick for the best pocket Radios. When the four AA batteries that the Sangean needs are an inconvenience, then you might be relieved to know that this pocket radio uses only two batteries. Unlike our top pick, this pocket radio features a functionality that allows you to disable the display screen so that the reception becomes clearer. Another great feature that this radio has is the ability to prevent a stronger signal from overriding your favorite but weaker station. This allows you to listen on end to the shows that you love regardless of the poor reception, which makes it a worthy alternative to the top pick. With an excellent sensitivity and selectivity through the inclusion of 5 memory preset that you select by the press of a button, your listening is enhanced. These five buttons are conveniently located so that you choose the preset station with ease. A backlight is provided to easily see what frequency you are listening to even in the dark. The backlight eliminates the hassle of fumbling with the buttons. Additionally, you can also use this radio as a clock, an alarm, and a sleep timer. You do not need to spend so much money on a device that you only use to listen to the radio alone. This high versatility is, therefore, a welcome relief and a good value for the money you spend on it. Featuring an inbuilt speaker that can also be used with headphones, no condition will hinder your listening experience. When you are in a place where noise is prohibited, you use earphones or enjoy the high-quality sound from the 5W, 16Ω, 1.25” built-in speaker. The sides of this radio are coated with rubber for a much firmer grip. Accidental slips are, therefore, prevented since you will be sure of yourself as you hold the radio. Additionally, this rubber also absorbs some of the shocks if the radio drops. The CC Pocket Radio has AM, FM and NOAA Weather Band reception capabilities. You, therefore, have a wide range of stations from which you can listen to. By pressing a combination of 1 and 5 buttons, the display is turned off, noise is reduced, and a clearer reception established. This radio is very light because it weighs only4 ounces. This makes it easy to walk around with and even take part in various exercises while it is in your pocket. Uses only 2 AA batteries. Frequency tuning steps can be selected. When you are on a budget, you do not have to put off your aspirations of having a pocket radio that is still of high quality. The BOCTOP Pocket Radio is a good example of high quality at an affordable price. It is lightweight, has a strap for carrying it around and clear sound built-in speaker. If you have both AM and FM favorite radio stations, then this radio forms a very good option for you, and at a low cost. The slim construction allows this radio to slip into your jacket and shirt pockets easily. A choice between speaker and earphone modes gives you flexibility when it comes to listening to your favorite song when being played on a channel or program wherever you are. You can always plug in your earphone to the 3.5 mm earphone jack. When you are using the earphone mode, you can as well choose the stereo mode for more comforting sound. When using the speakers, a dynamic bass provides an enjoyable experience. There are two powering options for more convenience. You can decide to use the 2 AAA batteries or use a 3V DC adapter, the two powering options will give you chance to choose whichever works best for you. When it comes to multi-tasking, this radio is quite good at it. It acts as an AM/FM radio, a clock and an alarm to wake you up for those important errands. All these features are displayed by the easy to read LCD screen. The Frequency range of the signal reception ranges from 520 - 1710 KHz for AM and 87.5 – 108 MHz for FM stations. The Sound of Noise Sensitivity is more than 6μv for FM and more than 3Mv/m for AM. Other specifications include a Sound Noise Ratio of more than 50dB for FM and more than 40dB for AM. What if our Budget pick pocket radio is still expensive for you? Do not worry either since there is still a pocket radio for you. It is super light, cheaper than the rest of the other pocket radios in this review, and still delivers almost the same sound quality as the rest. At 3.04 ounces, this radio is like a feather. Apart from the sound, you may not realize that it is in your pocket. To produce high-quality sound, an inbuilt speaker and a headphone jack are provided. It is then upon you to choose whichever suits you. To ensure that your favorite radio channel is received with utmost clarity, a telescoping antenna is provided. To use it, you simply extend it out for a better reception and push it back when storing or when the reception is good without the antenna. And if you do not want to carry it in your pocket, or you do not have a pocket in the first place, there is still a strap that you can use to carry the radio around. Such a convenience is very valuable. This Sony pocket radio is powered by 2 AA batteries, sold differently. The batteries are readily available in any store near you. Additionally, an LED indicator for the battery status is fitted onto the radio. There is also an LED tuning indicator. These two indicators show you how much power your batteries have left as well as the strength of the AM or FM signal being received. If you want a high-quality pocket radio and is not worried about the price, then the Sony ICF-S10MK2 Pocket Radio is your go-to product. This pocket radio boasts of a reputable manufacturer as it is made by Sony, which is known for quality electronics. 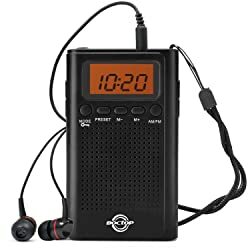 For such a high price, you get a pocket radio with an AM and FM tuner for choosing various talk shows plus music programs from your favorite radio stations. All these are output by an inbuilt speaker or an earphone when you need your privacy listening to something you love. Or it could be that you do not want to disturb those around you at the campsite. With the mono earphone jack, you can continue listening in even when you are in noisy environments. When in a low signal broadcast area, do not worry about the reception as the telescopic antenna is good at tapping onto those faint signals for clearer listening. A tuning LED indicator has been included in the radio to light brightly when a frequency with a clear signal reception has been tuned. The light dims when there is no such reception. A carrying strap has been included so that you can easily carry the device around as you exercise, walk or go jogging. To power your pocket radio, you only need two AA batteries. The availability of these types of batteries makes you have a non-stop listening experience. These batteries provide you with approximately 45 hours when listening to AM radio bands and 40 hours of battery life when listening to FM stations. 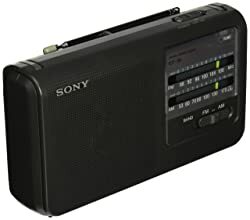 When you are a Sony products enthusiast, and you happen to miss the others in this review, then this pocket radio is your perfect alternative. It delivers you exceptional sound quality even in extreme weather conditions. 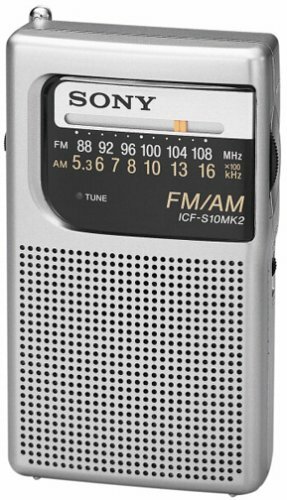 Sony ICF38 Portable AM/FM Radio is the best portable radio, with approximate 4000 customer reviews on the market. By being highly portable, it would well suit a lover of live radio shows, talk, and music which is constantly on the move. Better still, you can as well use it in your house, garage or on the porch. This pocket radio has incorporated a built-in handle into the design to make carrying it a breeze. As an aid in precise tuning to the right station in split seconds, an illuminated LED tuner light produces bright light when you have tuned to the right station. By featuring a sleek, slim and ultra-compact design, this radio can be easily slipped into your pockets (shirt/jacket) or even handbag for the ladies. In the spirit of sharing, a 3 5/8” speaker has been fitted to the radio so that those around you can also hear what you are listening to. But when you need to mind your own listening, you can use the earphone which is clearer even in noisy environments. Battery life is prolonged by the use of 4 AA batteries. These deliver up to about 80 hours in extended plays. An analog AM and FM tuner allows you to choose any show or radio station that you may want to listen to. A telescopic antenna does the signal receiving for more clarity. The radio has an AM frequency range of 530 – 1710 KHz, while the FM ranges from 87.6 – 108 MHz. Finally, this radio weighs only 2.02 pounds. Nothing beats the performance of the Sangean Portable Digital Radio and that is why we have chosen it as our best pocket am fm radio. An LCD screen which is backlit, 10 station presets and 2 alarm timers, no better device can do that. When you set the alarm to wake you up, a Humane Wake System gradually increases the loudness of the alarm tune. In this way, you will not be woken up abruptly. I hate alarms that seem to be harassing me when waking me up. This is from a personal experience since I own this pocket radio. There is no way I am going to miss on such amazing listening experience and functionality. What I love most about this pocket radio is the preset memory in combination with the auto-seek function. Have you ever used any of the pocket radios that we have discussed above when going for an outdoor activity? If yes, which one did you use and how can you describe how it performed? Are you planning to buy any particular pocket radio brand for your next outdoor camping music entertainment?